In this sailor shrug dress, you'll have no problem finding a sailing partner! 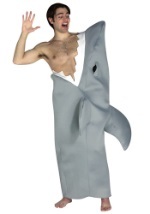 The costume consists of a blue dress that is made from a polyester and spandex blend. It zips in the back and has off-the-shoulder sleeves that are long. The sleeves and top and bottom hemlines are lined with white trim while the top hemline has the anchor appliques. The right hip has a large heart and anchor applique as well as the back. Complete the look with the included white scarf. Complete your look with the white, sailor hat that slips on over the head and features an anchor and two heart appliques. 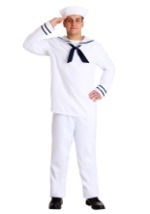 Our anchor necklace and sailor shoes are a fun addition to this costume!